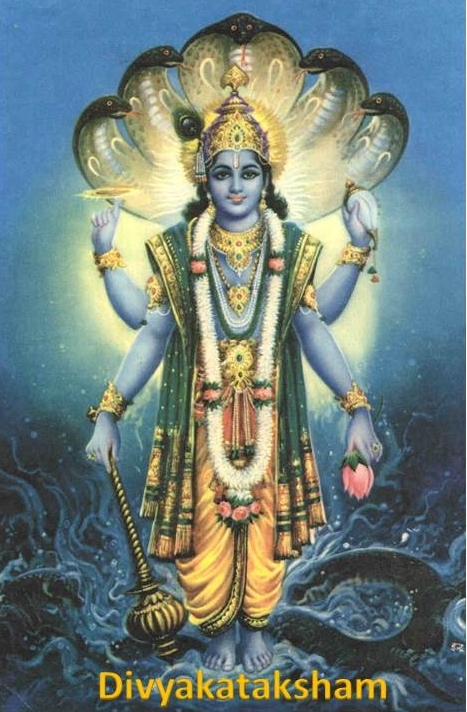 In this Part we will explore the meaning of the 27th Shloka of Sri Vishnu Sahasranamam. Sankhya means a number. Asankhyeyah means One who cannot be quantified. Sri Adi Sankara says ‘Yasmin sankhyaa naamaroopa bhedaadibhih na vidyate iti Asankhyeyah – Since he cannot be enumerated in terms of name, form etc he is Asankyeyah. “O Lord of the Universe! I see your Universal form with numerous arms, stomachs, mouths, and eyes, of boundless forms on every side, and I do not see the beginning, the middle or the end”. HE is of infinite knowledge, infinite bliss, infinite manifestations, immeasurable strength, etc. This fully sums up the import of the name asankhyeyah. 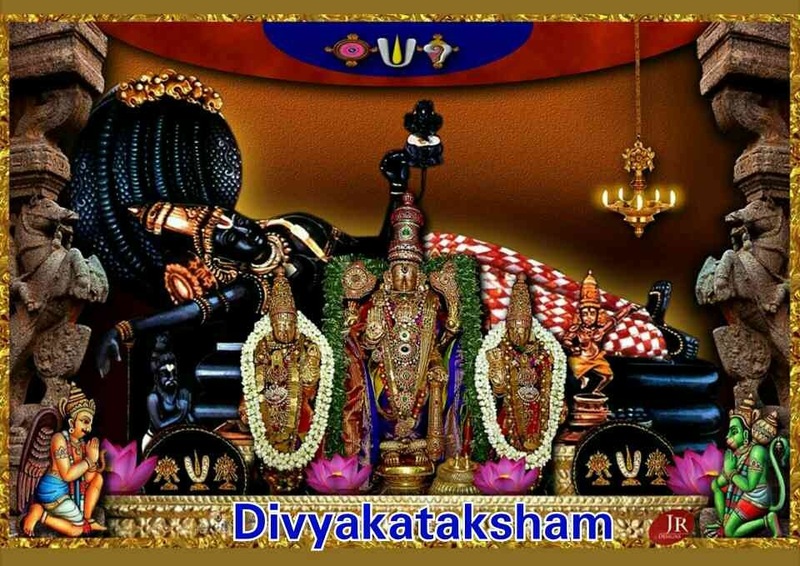 Sri Adi Sankara defines this Nama as ‘Aprameyah atma svaroopam asya iti Aprameyatma – His true nature cannot be inferred by direct or indirect knowledge. We have already seen the full meaning of Aprameyah in 46th Nama. Sri Satyadevo Vasishtha gives the interpretation “Pramaanaih pramaatum ashakyah aprameyah”. Prameya is anything that can be known through intellect. Aprameya is one whose nature cannot be grasped by any of the existing means of knowledge. We get an impression of an object by seeing it with our eyes, and it is this vision of the colour, shape, smell and other attributes that gives us a feel for an object. Bhagavan is beyond our senses. He gives reference from Yajurveda – na tasya pratimaa asti yasyanaama mahad-yashah – Yajur. 31.3. Thirumangai Azhwar said “நான்மறைகள் தேடிஎன்றும் காணமாட்டா செல்வன் – Naan maraigal thedi endrum kaanamaatta Selvan” meaning Having read the four Vedas, the Lord’s limitless wealth is indescribable. 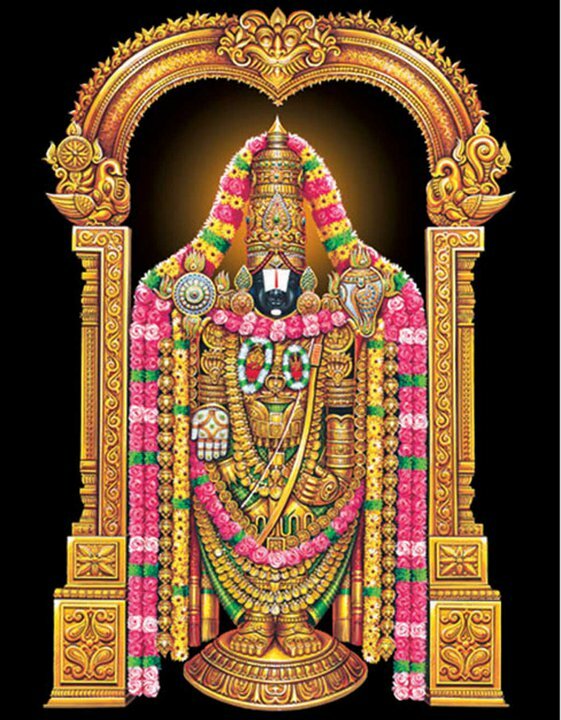 NammAzhwar says – “தனக்கும் தன் தன்மை அறியாதவன் – Thanakkum than thanmai ariyadhavan” meaning even HE cannot see his full splendor. Sri Radhakrishna Shastri points out that this Nama is a compound form of the Namas Aprameyah (46) and Ameyaatmaa (103,181). Vishishtah means someone who is superior or more refined and cultured as compared to others. As Sri Adi Sankara puts it ‘Atishete sarvamatah Vishishtah – He is Vishishtah because he excels or transcends all others’. Sri Parasara Bhattar interprets this Nama as signifying that He is Superior because He does not have to depend on anyone or anything and He excels in everything. The Dharma Chakram writer points that superiority in life is not achieved by wealth, power and fame, but is achieved only when we develop an attitude of devotion towards the Lord. Sri Adi Sankara gives two meanings for this Nama. The first is ‘Shishtam shaasanam tat karoti iti Shishtakrit – He is Shishtakrit because he governs or rules over people’. The other meaning is ‘Shishtaan karoti paalayati iti – He protects the virtuous followers’. This is consistent with the common saying that Bhagavan’s task is ‘Dushta nigraham and Shishta paripaalam – Punishment of the wicked and protection of the virtuous’. An alternate interpretation given is that Shishta means discipline, good manners. In this sense, the previous Nama would mean that He is Vishishta because He is of Supreme discipline, and the current Nama would mean that He helps His devotees acquire this discipline through the mental strength etc. needed for this. Because of association with Him, He makes His devotees also superior. Shishta also means law, rules, or commands. The interpretation then becomes He is the One who makes the law, the One who commands, or the One who protects (though the laws). The writer in Dharma Chakram says that the greatest and most significant of these commands is Love, through which MahaVishnu rules over us all, and this is the lesson to be derived from this Nama. 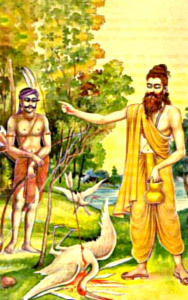 Valmiki, who was born in a Brahmin family was originally known as Ratnakara. His lineage originated from Sage Angira. Though Brahmin by caste, he fell into a company of thieves who used to commit robberies and became a notorious dacoit. Since childhood he did not strive to receive education. Hiding in a jungle, he used to rob and relieve people of their belongings. By such acquired wealth he used to look after his family and these evil activities continued for a long time. Ratnakara was accustomed to seeing frightened faces that used to cry and beg for his mercy and would plead with him to pardon their lives. But Sage Narada showed no signs of fear on his face and even had the courage to question his actions. Hearing this reply from all the family members, Ratnakara was disillusioned. He was toiling, committing sins, taking risks, day and night for them and here they were not even ready to share his sins. He saw the futility of his actions he had been committing. He realised that he alone was responsible for all his sins and no one else would share his sin. Sage Narada after thinking for a while asked him to chant the Rama Nama but for Ratnakara even pronouncing it was difficult. 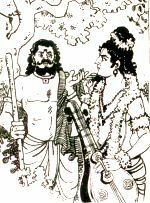 When Sage Narada saw that even after trying very hard, Ratnakara was not successful in his attempts to chant Rama’s name, he asked him to pronounce it backwards that is ‘Mara’ (as a dacoit he was accustomed to say this) and then Sage Narada made him sit beneath a tree and asked him to go on repeating it. He said, I shall come here again, till then you should not get up and go away.” Then the sage departed. Ratnakara continued his ‘tapas’ chanting the name of ‘Mara’ which when repeated sounded just like ‘Rama’. His whole mind was concentrated on the chanting of the name of the Lord He forgot his existence. He neither had food nor sleep for days. And in this way quite a few years passed. An ant-hill grew all around and above him. He could not even be seen by anybody. He prostrated before Narada again and said, “Sire, all this is your kindness. The company of good men uplifts man. I am myself a proof of this.” Narada blessed him and went his way. Sage, Valmiki, now formed his Ashrama near the river Ganga. One day, Valmiki had the fortuity of receiving Lord Rama, Sita and Lakshmana at his ashram. His happiness knew no bounds. 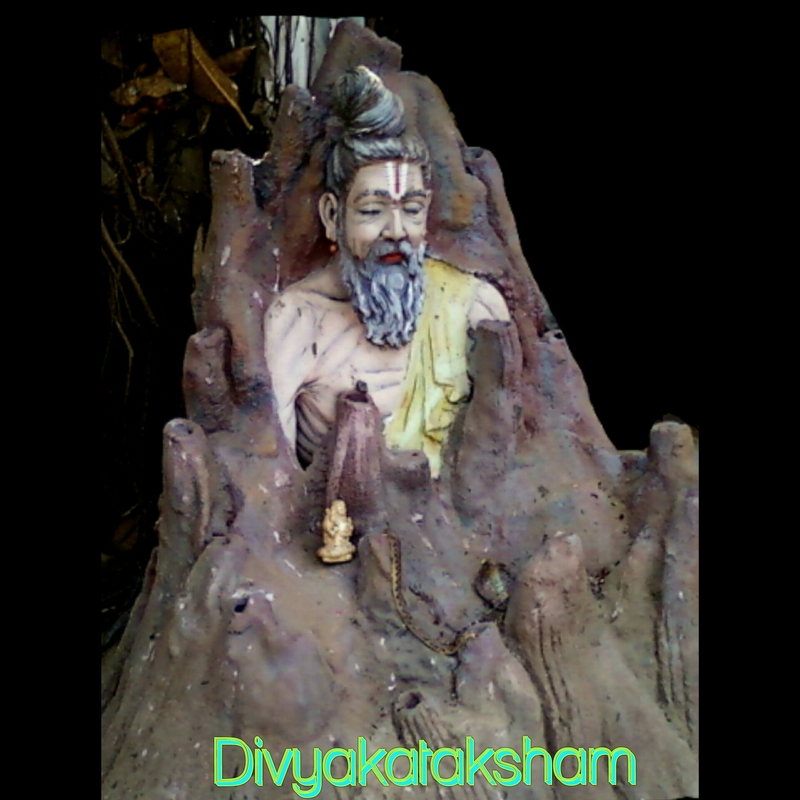 On Valmiki’s suggestion, Lord Rama built his hut on Chitrakuta hill, near the ashram. In answer to Valmiki’s question, Narada mentioned the name of Sri Rama. 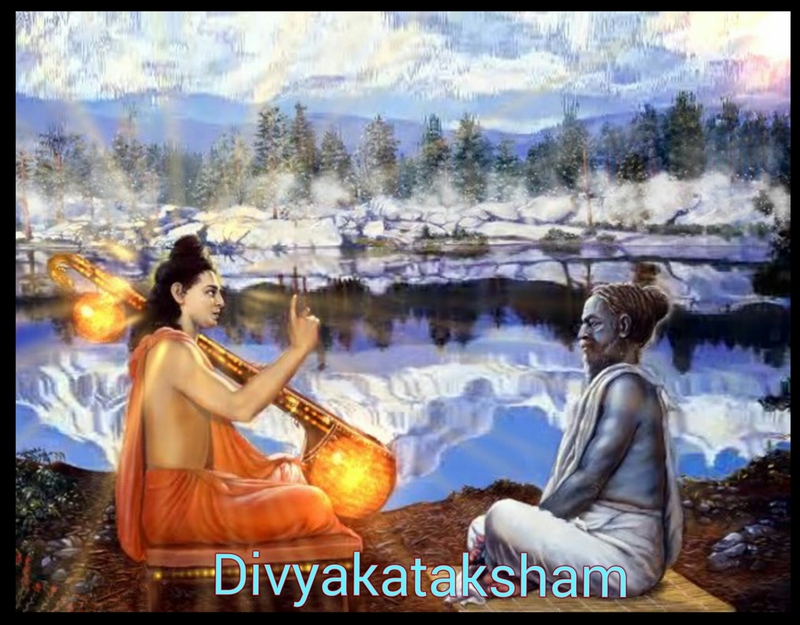 Narada narrated the story of Lord Rama. The divine sage blessed him and left. Emerging spontaneously from his rage and grief, this was the first Shloka in Sanskrit literature. Later Valmiki composed the entire Ramayana with the blessings of Lord Brahma in the same meter that issued forth from him as the śloka. Thus this śloka is revered as the “first śloka” in Hindu literature. Valmiki is revered as the first poet, or Adi Kavi, and the Ramayana, the first kavya. 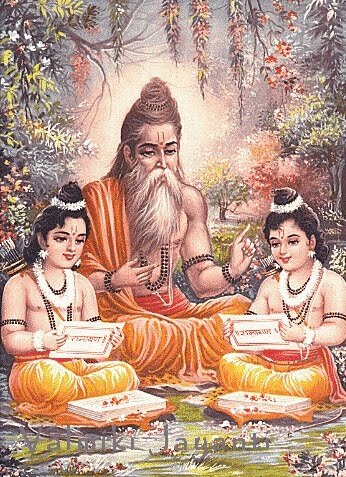 Valmiki wrote the great epic ‘Ramayana’ consisting of 24,000 verses in seven cantos (or kandams). He taught the Shlokas first to the sons of Sri Rama, Lava and Kusha. They were born twins in Valmiki’s Ashrama and grew up there. 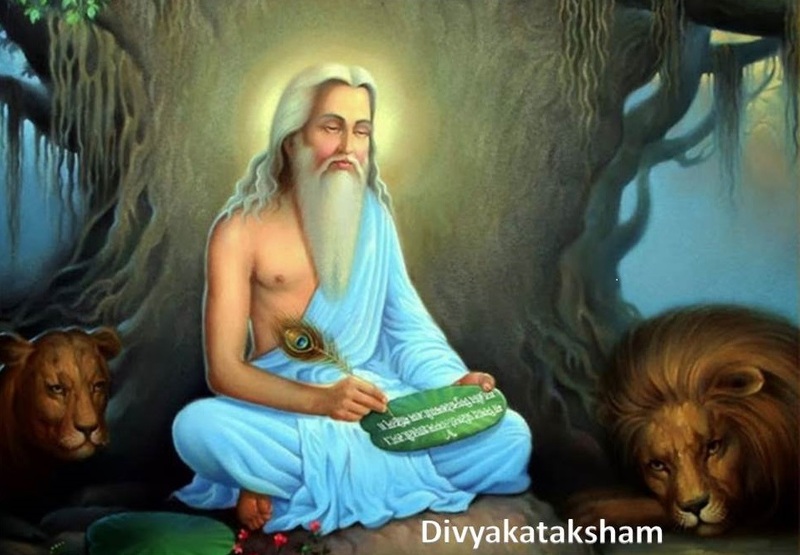 Ratnakara, once a cruel dacoit who was uneducated, engaged in looting and killing people was transformed to become the most noble Sage Valmiki because of the effect of chanting Lord’s name even though backwards or incorrectly. The story of Valmiki demonstrates how the Lord makes his devotees Superior who associate with Him. Basically the word Shuchih is linked to purity. We have already covered this as 157th Nama. There the main emphasis was Bhagavan’s role as a purifier of his devotees. In this Nama Sri Adi Sankara interprets this to say ‘Niranjanah Shuchih meaning Bhagavan is completely free from any fault or impurity and hence he is called Shuchih or pure’. He is pure by body, mind and action. Lord Krishna demonstrated his purity when He brought back Parikishit to life after Ashwathama used Brahmastra. This is related to the two immediately previous Namas – Vishishta and Shishtakrit. He is pure and makes everyone who is associated with him pure. The writer in Dharma Chakram says ‘Just as we clean our body to avoid diseases, we can develop cleanliness in our words through the chanting of the names of the Lord. This will help us to develop and improve the cleanliness of our thoughts enabling a better control of the five senses, which are the means by which we get inputs to our thoughts from the external world”. 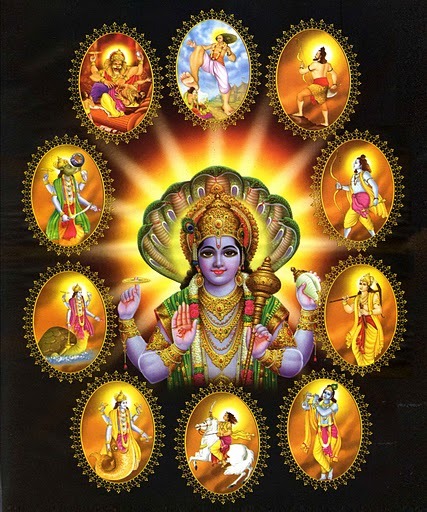 There are nine ways to worship the Lord but the most important feature is the need for unflinching Bhakti or devotion. Meditating on the Lord, listening to chanting of His names, listening to Bhajans, observing the beauty of the Lord, smelling the divine fragrance of His presence in the temple, etc., are the different ways in which the five sense organs are exposed to the opportunities for cleansing the thoughts. Deep meditation on the Lord is one way to train our mind. The need for constantly focusing of our body, mind, words and deeds towards Him is the lesson we should take from this Nama. He makes us shine consistent with our devotion. The basic meaning of ‘Siddh’ is to achieve or attain something. The following four namas are emphasise the aspect of achievement. It is believed that ‘Siddhaarthas Siddhasankalpas Siddhidas Siddhisaadhanah’ can be recited as a Mantra and its regular chanting will help to achieve desired goals. Sri Adi Sankara says ‘Siddho nirvrittah arthyamaanah arthah asya asti iti – One who has achieved or attained everything that is worth attaining’. Hence, Siddhaarthah refers to someone who has achieved all his objectives. Chandogya Upanishad (8.1) says ‘Satya Kaamah meaning His desires have been realised’. He already possesses all that is desirable in Him naturally and effortlessly. Swami ChinmayAnanda points out that this name signifies that Bhagavan has all the four PurushArthas (Dharma, Artha, Kama and Moksha) that are the object of attainment for mortals. He has attained all that is to be attained and hence He is Siddharthah. Sri Adi Sankara explains this as ‘Siddhah nishpannah sankalpah asya iti – One whose wishes are fulfilled’. One whose wishes are fulfilled at the very instance He wishes. Sankalpa means intellectual willing and wishing. One who gains all that He wishes for, or One who immediately gains what He wills is called Siddha-Sankalpah. For Bhagavan there is no time lag between the wish and its achievement. They are synchronous. Chandogya Upanishad says ‘Satya Sankalpah meaning His wishes have been realised’. The difference between Siddhaarthah and Siddhasankalpah is subtle. The first name is object oriented while the second one is subject oriented. In the first one the achieved goals are set by the external world whereas the second one talks about the achieved goals, which one sets for oneself in the form of a Sankalpa or wish. The writer in Dharma Chakram gives some examples of His being a Siddha Sankalpah – the decision to make Sugreeva and Vibheeshana the kings of their respective kingdoms, the destruction of Vali, the Sankalpam to fulfill Dasharatha’s promise to Kaikeyi etc. The devotion to MahaVishnu makes the devotees equally capable of fulfilling their own Sankalpas by His grace. The way we become Siddha Sankalpah is to entrust ourselves completely in Him and surrender ourselves, and He takes care of the rest in accordance with Dharma. Sri Adi Sankara gives the meaning ‘Siddhim phalam kartribhyah svaadhikaaraanuroopatah dadaati iti Siddhidah – He provides success or fruits to the actions in line with what the doers deserve to get’. In other words he is ‘Phaladaata’ or the provider of results to our actions. The other meaning for Siddhi is some sort of special power and Bhagavan bestows these extraordinary powers to His seekers. There are eight Siddhis or powers that can be acquired by yogis who meditate on Him. These are Anima (the ability to assume the size of an atom), Mahima (the ability to assume a very huge size like Trivikrama Avataar), Laghima (to make the body weightless like a feather), Garima (to assume heavy weight of huge boulder), Praapti (to obtain anything desired), Praakaamyam (to attain any desired bhoga), Ishitvam (to be able to assume rulership or Lordship over anything or anyone) and Vashitvam (to get anyone to be under one’s control). Bhagavan can bestow these on the worshipper if they desire them though a real devotee would not stray from spiritual enlightenment by seeking such powers. In the words of Sri Adi Sankara – ‘Siddheh kriyaayaah sadhakatvaat Siddhisaadhanah – He is the instrument of success for the action’. He is the very secret force which enables the seeker to diligently continue all efforts of his seeking. He is the Saadhanaa or means for all Siddhi or fulfillment, in particular the Moksha Siddhi, which no one else can help achieve except Sriman Narayana. Sri Radhakrishna Shastri points out that the sequence ‘Siddhaartas siddhasankalpah siddhi-dah siddhi-sadhanah” is a great mantra by itself and chanting it will be very beneficial for the fulfillment of our endeavors, when we undertake a good deed and work towards attaining the desired goal. The Dharma Chakram writer points out that the goal that is attained by chanting this mantra is the cleansing of our minds from worldly thoughts, lust, etc., and concentrating the mind towards thoughts about Him. By chanting this mantra, He ensures that we attain our goal. Bhagavan is Asankhyeyah as his attributes and forms are innumerable and cannot be quantified. He cannot be easily known by knowledge alone either direct or indirect. 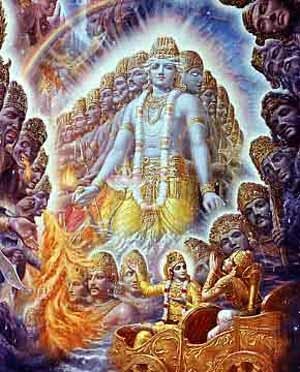 HE is superior and makes his devotees too are superior by their association with Him. HE is pure and possesses all the four Purusharthas that are the object of attainment of mortals. He is Sidhhisankalpah as his wishes are always fulfilled instantaneously. HE is the bestower of super human powers and makes the path of attaining Siddhi equally a blissful experience. The audio visual commentary of this Shloka will be uploaded on YouTube shortly.